McDonald’s. IHOP. Cracker Barrel. 7-11. Subway. 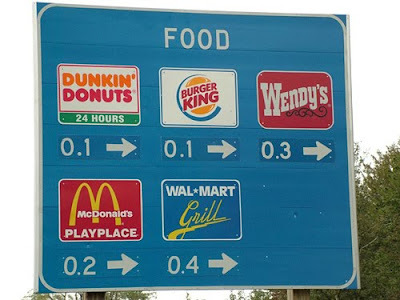 The American highway isn’t exactly the place for fresh and exciting gastronomic discoveries. The lack of appealing highway food options may seem obvious to anyone who has ever taken a road trip in the USA – and that’s probably most Americans, seeing as long-distance driving is practically a necessity in order to get anywhere in our vast country. 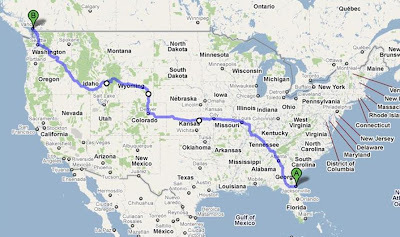 Last month I took the American Road Trip to the extreme when my girlfriend Lindsay and I drove from Jacksonville to Vancouver over the span of two weeks. Knowing my obsession with locally-colored, tasty meals, you won’t be surprised that I began to panic over the thought of subsisting on greasy McDonald’s, tasteless Cracker Barrel, and salty bags of Lay’s from 7-11 while barreling through these United States of ours. Sure, I planned to go out-of-the way as much as possible to sample specialties and unique regional culinary delights. But I knew it was unrealistic to expect to find a hidden gem right off the highway exit each time Lindsay and I found ourselves hungry and wanting a good meal…. RIGHT NOW! I decided to take control. I would be the decider of my culinary fate! I did a bit of research on how to eat well on an American road trip and was disappointed by the lack of targeted guidance available on the internet. So I ordered a book called Road Food by well-regarded authors Jane and Michael Stern. The book reviews a treasure trove of local eateries and provides great guidance on regional specialties across the country. I highly recommend it for anyone embarking on a similarly gargantuan trip; I looked to the book for advice a number of times. But again, I knew I wouldn’t always want to drive out of my way to find one of these places, especially when we were trying to cover 14 hours some days. And most of the options along our route seemed to be in the locally-adored hamburger place/ BBQ joint/ greasy spoon diner category – in other words, sodium and saturated fat central. For the sake of my waistline and my wallet, I planned to prepare an assortment of affordable, healthy, and tasty dishes in advance that would get us through the gastronomic doldrums that is… THE AMERICAN HIGHWAY (dun dun duuuuunnnnnn). Google maps tells me our route to Seattle was 3,335 miles, but the odometer clocked us in at 5,800 miles, what with backtracking and side-trips to creameries and BBQ joints and such. America has so much to offer in the way of regional food, and I wanted to save my calories and money for worthwhile experiences like slow-cooked ribs slathered in a smoky-sweet sauce and accompanied by mac’n’cheese in Nashville; a barbecue feast replete with fries double-cooked in lard in Kansas City; anchovy pizza and creamy tomato soup in Boulder; a cowboy dinner of steak and mashed potatoes in Wyoming; a Basque spread of croquettes, tortilla, and chorizo sausages in Boise; piroshky and halibut tacos in Seattle; and cioppino, Cambodian fried chicken, and shrimp tacones in British Columbia. You’ll read about these memorable meals and many more in upcoming posts, but for now, here are my tips on how a little preparation and foresight can lead to a lot of happiness on the road. In the same way I “pack black” when I travel, I decided to stick with a culinary theme. That way I could mix and match dishes and create a greater variety of meal options. When planning your road trip menu, think about dishes that develop more flavor the longer they sit and that aren’t highly perishable. You could pack Indian-inspired dishes, like lentils or any number of curried and spiced vegetables or meats. A Moroccan theme is a great idea, as the cuisine affords many options that are equally good cold or room temperature as they are hot. (Just in case the crusty attendant at the 7-11 forbids you from using the microwave usually intended for nuking frozen burritos.) How about a raw carrot salad flavored with cumin and golden raisins? Or couscous tossed with harissa, chickpeas, and dried apricots? In the end, I decided on a Mediterranean theme for our road trip food. I made the couscous dish described above, along with Italian-inspired dishes like eggplant caponata, herb-roasted chicken breasts, and lemon-garlic orzo. All could be eaten cold straight out of the cooler, or warmed for a heartier dinner. 2. Don’t forget about fresh foods. I have a tendency to eat a lot of bagged snacks when I’m traveling by car, but I wanted to avoid chips and Doritos as much as possible. Sure, we munched on Cheez-Its and Triscuits and pretzels, and that bag of peanut M&Ms provided the courage needed to get us through not one, but two white-out blizzards. But mostly we tried to keep it fresh. Carrots dipped in hummus were a convenient, quick, and crunchy alternative to salty bagged snacks. Cherry tomatoes came in handy as both a good snack on their own and halved and tossed into our lemon-garlic orzo for some variety. Another good idea is to cut a lemon into wedges and throw it in a Ziploc bag. One squeeze is all you need to freshen and brighten up pre-prepared pastas or chicken or vegetables. 3. Hold back on the salt. Salt makes you thirsty. That means you’ll drink more, and that means you’ll have to make more restroom stops. Save yourself some travel time by holding back on salt in dishes you prepare. Many traditional road snacks have a lot of sodium, so try to purchase lightly salted nuts and pretzels and chips. Sodium-laden lunch meats are horrible, so roast some chicken breasts at home before the trip and use them for sandwiches and dinners on the road. Keep in mind that cooked chicken will be the first thing to spoil; you’ll have to eat it by your second or third day of traveling. I like to roast chicken breasts with the bone-in and the skin-on. The meat retains its moisture that way, and once you’ve sliced the chicken and packed it up you can toss the bones in a bag, chuck ‘em in the freezer, and make a pot of chicken stock when you get home. Make sure to cut the chicken into bite-sized portions so you don’t have to struggle with plastic cutlery on the road. There’s nothing wrong with making a cheesecake or a loaf of banana bread to get you through those looooooong driving days. They’re better than Snickers or Baby Ruth or sugar-laden breakfast bars. - Start saving plastic or Styrofoam food containers, like those your take-out or delivery meals are served in, and pack your road food in them. That way you can re-use a receptacle that would otherwise get tossed after one just one use. - Travel with someone you like… and who has a good appetite (Lindsay, you rock!). - Don’t forget to pack: lots of water; an insulated mug for taking hotel coffee on the road; a cutting board, knife, and wine key; and disposable cutlery and plates. So you did it! Good - and I'm sure you've got tons of material for many posts - trips are great blog fodder. We avoid having to make snack stops by putting together a big bag of nuts, raisins, and cranberries. And we got an Igloo cooler that plugs into a receptacle the back of the car, so we can always have whatever we want to drink. We too try to plan those dining opportunities, but given the nature of the business, our best plans are often derailed and we have to punt - and some of our best experiences have resulted from a failed plan! We like Seattle, but Vancouver is absolutely our fav NW city - perhaps the most civilized and diversified city we know - looking forward to hearing of your impressions. Hope you guys have great fun. Great topic and sounds like a fun trip. We spend time visiting family in the midwest every summer and see a lot of signs like the one here. (Susan M. tipped me off to your food blog; when not running Social Capital Inc. I too enjoy cooking, good food & wine and blogging about it. Hope all is well).